The hype has started to stagger, hasn’t it? Your new moon was beautiful, and it brought you many new opportunities and ideas to explore in May. Now reality is here, and you actually have to put in the work. Beloved, I get the sense that you don’t feel as though you’re in your power right now. With this full moon being in your opposite sign, you may in fact be self sabotaging yourself. You may be telling yourself you’re not in control, you don’t have the money you need, or the time to expand on your ideas. But actually beloved, you are in total control of every move you make, and every idea you have right now. This full moon in Sagittarius is sending you extremely grounding and powerful energy to propel you further into your vision. How would you define success, Gemini? What does success look like to you? This may be on your mind now. You have three reversed Pentacle cards in your reading. Value and worth may be a deep problem in your life right now. If money has been an issue, the 4 of Pentacles says that you can find stability and control once you focus in on the task at hand. With so much mutable energy, you could even be feeling erratic and unstable. You could feel like money is slipping right through your hands, and this is why you can’t focus on your deep desires or dreams at the moment. This feeling will pass, and abundance will be on it’s way. But you first must gain more control over your relationship with money, beloved. If you’re thinking about money every day, you may have some negative thought patterns or beliefs that are poisoning you. Before I did your reading and was meditating on your sign, the Ace of Cups came out with the reversed Ace of Pentacles. Which does mean new beginnings are going to find their way to you in your love life and in your financial circumstances. But if you’re pursuing anything right now with ill intentions, it will backfire. Instead of you gaining a foundation of control, you might end up feeling controlled in a situation. This means, hold tight to your vision right now, beloved. If you don’t harness desire in your heart, it might slip right through your fingers in reality. As corny as this may sound, what makes you happy does influence your ability to manifest and reach success. Your desires are what’s going to push you forward right now. Not what you think is best, or what you think is most practical, but what it is that you truly fantasize about. The Devil in your reading along with the 4 of Pentacles indicates a desire of control. Don’t let your dark twin come out right now, beloved. If you give into your darkness right now, everything will go sour. But if you focus on what brings you a sense of peace and stability in your life, you will manifest more of it. Work your mutable magic, beloved. Make some moves, leave some things behind, and come back to the light. It’s time to make a change that will effect your physical reality. We’re still in your season, after all. Magic is all around you. Don’t block your blessings. 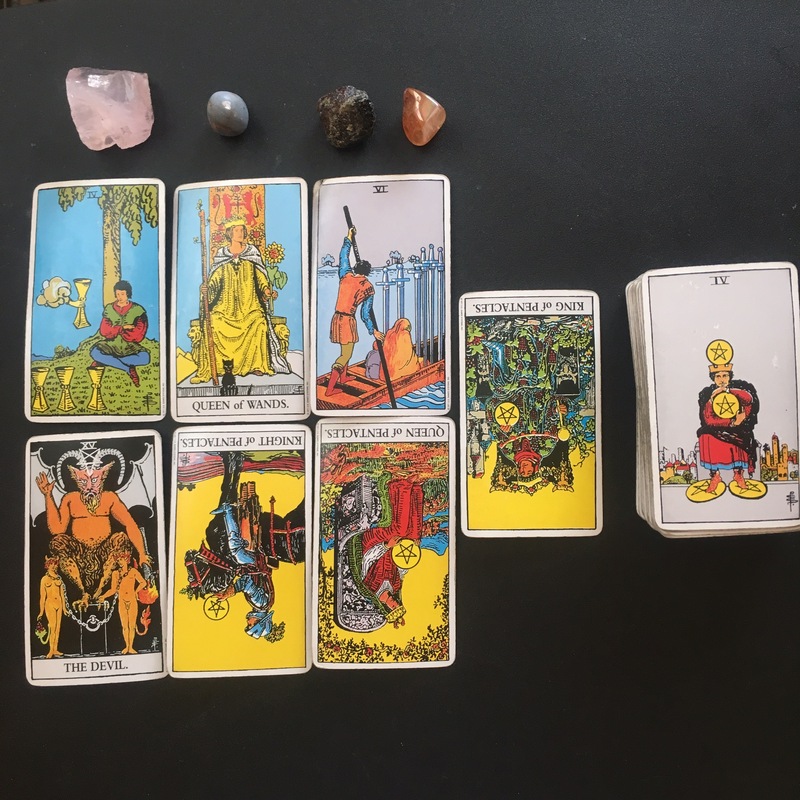 Previous Taurus: Full Moon in Sagittarius Tarot reading, 2017. Nobody can compete with you! It’s time to switch up. Next Cancer: Full Moon in Sagittarius Tarot reading, 2017. The path to wholeness and fulfillment starts now.